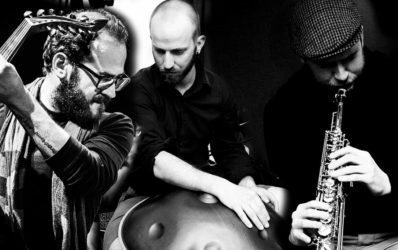 Two-thirds of the world music Baldachin Trio invite the exceptional Syrian musician Orwa Saleh to a musical rendezvous. The virtuoso oud player has studied classical Arabic music in Syria and Lebanon and has a great passion for jazz and world music. The curiosity to let one’s own musical roots merge with strange sounds and to lead oneself into unknown sound worlds connects the three musicians. An exciting combination of musical styles generates exquisite listening pleasure when the self-taught Lower-Austrian Niklas Satanik elicits gentle rhythms from the Swiss instrument Hang, the Vorarlberg artist Lukas Schiemer accompanies harmoniously with either saxophone or piano and Orwa Saleh tells his Oud stories with an emotional punch.